Here, I am going to focus on point 4 from the article “Heresies of Jim Wilhelmsen of EchoesofEnoch.org”, to better explain that Jim Wilhelmsen is teaching a different Jesus Christ than the Bible teaches, and one who did not come in the flesh. Jim in fact teaches that part of Jesus Christ’s flesh (His blood) came from a parallel universe, and so these teachings contradict that Jesus Christ came in the flesh per biblical definition. This reveals that the spirit behind these teachings is antichrist, per the Bible. It can be difficult to understand what Jim teaches, so first I am going to explain what he is teaching, and then explain the ramifications this has to the flesh and blood of Jesus Christ, and how this contradicts the Bible. So you have some idea what we are looking at before we start: Generally, Jim paints of picture of God and eternity which is confused with the kingdom of God, and a parallel earth where no one ever sinned, no one has blood, as all being combined together as eternal in what Jim calls the parallel dimension/universe of “Heaven” or the “Old Heaven” or “New Heaven”. This is in contrast to our dimension/universe of “linear time”, which Jim claims is a parallel dimension/universe created through Satan and the Fall. Jim claims we are in a “linear time” divergence from the eternal “Heaven”, in which we all have gained blood in this fallen dimension of ‘linear time’, time which in fact is not so linear as it eventually loops back around on itself to before the Fall. First, let’s look at Jim’s writings to see how he defines his terms, and how this contradicts the Bible. It is true that God’s domain, where God alone exists, is outside of time, seeing as God created time and was here before time began. But Jim’s first mistake is to call the eternal domain of God to be “Heaven”. God existed before time, and before the earth or any or all of the heaven(s) were created. The Bible indicates there are 3 heavens: the 1st heaven being the atmosphere where the birds fly, the 2nd heaven being outer space, and the 3rd heaven being God’s throne where the angels live. http://carm.org/what-does-it-mean-when-bible-refers-third-heaven All 3 of these heavens were created by God in the beginning, when “God created the heaven” and created time itself. The eternal realm of God is not “Heaven”, not even the 3rd heaven. The 3rd heaven is a created place that had a beginning, it was created for the created angels to dwell, whom also had a beginning point in time, the same as people do. God is in the 3rd Heaven, but He is also beyond it as the “heaven of heavens” (3rd Heaven) cannot contain Him. In fact being eternal is an attribute of God (Father, Son, Holy Spirit), and nothing and no one else has this attribute, because everything else that exists He also created. Psa 90:2 Before the mountains were brought forth, or ever thou hadst formed the earth and the world, even from everlasting to everlasting, thou [art] God. Exd 3:14 And God said unto Moses, I AM THAT I AM: and he said, Thus shalt thou say unto the children of Israel, I AM hath sent me unto you. What Jim does is confuse the attribute of God alone, of being the eternal I AM, as an attribute of the place of the 3rd Heaven. But this is incorrect, as the 3rd Heaven was created and had a beginning, per Gen 1:1. In other words “eternity/eternal” is an attribute of God Himself, not the 3rd heaven, nor those of the “kingdom of God”, all of which are created places and beings with a beginning point in linear time. Conceptually, “before” God created time, God alone IS, existed as eternal in eternity. Jim’s second mistake, is to take the “eternal” attribute of God alone, and after wrongly lending this attribute to the 3rd Heaven, to then proceed to claim this fits the definition of a “dimension”. This is incorrect according to the scientific use of the term “dimension”. We live in a world where we can perceive 3 spatial dimensions (length, width, height) and 1 dimension of time. It’s clear that God created the dimension of time, “in the beginning”, “before” which there was not time, there was only God who is eternal. Thus we know that the “dimension” of time is a byproduct of the creation process. Similarly, the earth and heavens were created as spatial places and they have the attribute of these “dimensions” of length, height, width (as well as time). Again, the “dimensions” of length, height, and width are seen to be byproducts of the creation process. Thus, “dimensions” are things that God created when He created the heavens, and the earth, in the beginning (of time). Dimensions are created things, attributes of the created world, and God existed before any dimensions existed that He made. God who alone is eternal, outside of time, outside of space, the earth, the heavens, all of creation, with all of it’s dimensions – is Not Himself another dimension in His eternal attribute, nor in another dimension. God alone is outside of and beyond all dimensions, as dimensions are things He created. However, after confusing the 3rd Heaven as being eternal (which it is not), then (as we shall soon see) Jim confuses the 3rd Heaven with the Kingdom of God (God’s children), he then further confuses this with an imaginary invention of a perfect universe where no one ever sinned (and no one has blood), combining all this together as being one place with the attribute of ‘eternal’ (which none of these do have and/or would have if they existed) as ‘eternal’ is an attribute of God alone. Which leads to great bible-contradicting confusion, which we will get to soon. But before that, building on the prior two mistakes, Jim then labels the ‘eternal’ (3rd Heaven & Kingdom of God & Parallel universe sinless world), as being a “parallel dimension”, making use of the science fiction use of the term “dimension”. In fact a “parallel dimension” in science fiction parlance is better called a “parallel universe” for clarity’s sake. This is because in science fiction each “parallel universe” is composed of it’s own “dimensions” (length, width, height, time) as per science, modeled after our own universe. As such in science fiction stories it is possible to conceive of a “parallel universe” which has fewer, like only 2 spatial dimensions, or more, like 6 spatial dimensions, or any number of “dimensions” (per science terminology) as you might like. I can recall at least one scifi story in which the so-called cosmic egg of the big bang had never exploded, and inter-dimensional travelers in a spacecraft had to instantly leave (before they arrived) so as to avoid becoming non-existent due to the lack of “dimensions” in existence in this immature “parallel universe”, in which, as 4-dimensional creatures, they could not survive an instant with 0 dimensions present (..or it was something like that). There would appear to be a total different description in the accounts of the generations in the day God created, and when the LORD God created. The idea of one account created by the LORD God suggests, as the title indicates, that the covenant God created. The covenant God would indicate the need for a covenant as an act of redemption.This acting God of redemption would only be active as creator in the dimension that had fallen. Therefore the account following would be the alteration necessary for the fallen generation within that fallen parallel dimension. The other account by God would require no redemption. This describes his perfectly willed plan that he initiated and carried out. It is in this sense Heaven and Earth are parallel dimensions; one carried out to perfection, one fallen into a distortion yet both existing at the same time. Now if heaven and earth exist as parallel dimensions then we need to look at some very important differences. In the generation, God created Adam and Eve who conceived and bore Seth. There is no mention of Cain and Abel in the generation that God created. Seth was the lineage that Jesus would come from and described as the “chosen.” Could this be the reason they were the chosen? Because in God’s original intended creation, were they the only intended race to exist? If, as many have claimed the overlapping stories of the same event is truly that, why is the last account in Gen 5 not the most detailed? Remember the opening lines here declare, “..this is the generation of Adam in the day God created.” This account has excluded any mention of Cain and Abel. If this is the detailed description of the same account prior mentioned in 1,2 or 4 certainly the most important part of lineage; who is the firstborn, would of been mentioned. Here, as I mentioned, Jim defines “Heaven” to be a parallel universe, one in which Seth was Adam and Eve’s first son. (Already having covered Jim’s Serpent Seed Heresy of Satan fathering Cain elsewhere, we will skip that for now.) Jim claims this original intention of God seems to be reflected in Gen 5, like the scriptures are a window into the events occurring in this perfect parallel universe, existing beside us. In fact Jim seems to think that the use of the different terms “God” and “Lord God” in Genesis could reflect God in the perfect parallel universe, and God in the fallen parallel universe in which we live. But this perfect parallel universe is also defined to be “Heaven”, which Jim has already defined to be “the eternal realm”. How does Jim say we got to be in this fallen “parallel universe” we are supposedly in? A wrong choice was made putting man in a lesser state, spiritually separated from God, physically in a lesser form and placed into an entire altered dimension. Jim teaches that prior to the Fall there was only 1 perfect parallel universe, in which God created Adam and Eve to have no blood. But after the Fall, Jim indicates Adam and Eve took the wrong “dimensional portal”, so blood was added to their bodies, and linear time began, where Adam and Eve were projected away from eternity (the perfect bloodless parallel universe or dimension of “Heaven”). It is also important to note that Jim states Adam and Eve were created to be like their “Father” which means they had no blood. So how is it that you and I in this fallen parallel universe can be the same you or I that co-exist, right now, in the perfect parallel universe in bloodless bodies, never having sinned? The story Jim tells, in as close as I can get to chronological order, further explains that not only do you and I exist here, and in a perfect bloodless parallel universe of “Heaven” in the “eternal realm”, but also you and I are also currently co-existing in a 3rd! place, which predates creation. This place is also the “eternal realm” of “Heaven” but Jim changes his terms to reflect that this 3rd co-existence predates our other (co?)existences. First there was the “Old Heaven” in which all of God’s children (all of them) existed in the “eternal realm” of “Heaven” before having experienced the fallen parallel universe we live in. This indicates that you and I as Christians existed in Heaven before we were born to our mothers. Uh-oh, that doesn’t sound right! God foreknew us and even wrote about us beforehand, but we did not exist before God made us each in the womb. Psa 139:16 Thine eyes did see my substance, yet being unperfect; and in thy book all [my members] were written, [which] in continuance were fashioned, when [as yet there was] none of them. According to Jim, before we were born, we pre-existed, but as “spoiled rich kids” who had never known anything else but being “rich and well provided for” living in “the Old Heaven”. Jim makes clear that you and I were existing around for a long while, even before the option existed of our ancestors, Adam & Eve, to take that wrong “dimensional portal” (tree) to the fallen parallel universe we know. To be fair, Jim later clarifies? that this pre-existence in the “Old Heaven” does exist? happen? parallel in “the eternal realm” at the same point? time? as we currently live out our lives in the fallen “parallel altered universe” that we know as existence. In other words, Jim teaches that you and I are right now also existing in the eternal realm, living on a parallel planet earth, never having sinned, with bloodless bodies – right now. Though, at the same time after the “Old Heaven” of this perfect earth, we will eternally/later/after-that learn from our experience of what it was like to live out our lives here in the non-perfect world we know. Because Jim also makes clear that after our lives in “the Old Heaven”, then we experienced “our mortal linear existence” in this fallen “parallel altered universe”, and after that we will get to the “New Heaven”, where we will have learned to appreciate the “Old Heaven” we once had. Jesus Christ is the only one who has seen God, and the only one who is God the Son, and so could exist both here, and in the past and future) because Jesus Christ is God and eternal. Jim is loosely laying characteristics that belong to God alone, even specifically Jesus Christ, onto the rest of Christians – but we are not like Jesus Christ in these respects, because He is God. Attributing characteristics that solely belong to God as being had by people that are His creation is an often seen satanic ploy. Another satanic ploy that is common in false teachings is to exalt Satan to have much more power than he ever does or did have. Jim’s last quote said “this whole dimension; the earth, the ski, heavens and all contained in this material universe is included as being outside of God’s intended and designed Kingdom…This distorted creation is an imitation by Satan and a parallel universe to the real thing.” Jim is in fact teaching that Satan was responsible for not just tempting man into sin, but rather Jim has amplified Satan’s power to state nothing less than the entire physical universe we live in, that the earth, the sky, the stars, all you can see, is all an imitation parallel universe created by Satan’s power. This extreme exaggeration of Satan’s power, far beyond biblical truth, is another tell-tale sign of the source of these ideas. So on top of everything else, Jim Wilhelmsen is teaching that all of linear time loops back around so that it begins with it’s own destruction, the earth in the beginning of Gen 1:1 reflecting the devastation seen when the Heavens and Earth are destroyed in Rev 21:1 or 2 Pet 3:7,12. 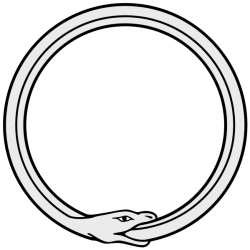 It so happens this is disturbing if you see it visually, as if you diagram time to be circular like this, the earth beginning with it’s own destruction, then it symbolically bears resemblance to an Ouroboros, the snake eating it’s tail. It’s an ancient occult, alchemist and Gnostic symbol for a rebirth cycle, made out of a snake or dragon. Despite the difficulty, as they make no sense, I have managed to draw out a fairly accurate diagram of Jim’s teachings, as well as a much easier to draw and understand diagram of Biblical truth about the heavens and time. I’m going to present them both here for you to compare. (The picture notes skip a little ahead, but we’ll get to that shortly). And I’m also linking a color depiction of God, eternity, and time which also is accurate, if you understand the red timeline to represent the earth and all 3 Heavens having a beginning creation point in time. And where the red line seems to merge at right angles out into eternity, see the other pencil sketch picture for details on how that works. Is this reality? No. God alone (Father Holy Spirit and Son) existed eternally, and created time, which has a beginning, and then time continues forever. We who have eternal life come to run parallel with our eternal God who made us, in the future living with Him forever, but we never become Him, nor do we ever share in eternity with God as an attribute He alone has. What I mean, put another way, is we will live forever with God in the future, but we always will have had a beginning point in time in which we were created, and prior to that point, we did not exist. God alone is the great “I AM” who is eternal. This is unlike Jim’s flawed cosmology, which has us existing before we were born, and after the New Heavens exist, and in a perfect sinless state in the parallel universe of “Heaven”, all at the same time we are existing as sinful creatures, right here and right now. In Jim’s cosmology our creation may have occured when we were born, but we also existed in “the eternal realm” before we were born, with God in Heaven. Jim’s essentially seems to be describing each of God’s children to have qualities that alone belong to Jesus Christ, by partaking in “the eternal realm” before we were born, or “the Old Heaven”, and co-existing at other points in “the eternal realm” at the same time we live our lives here. Another problem is that IF each of us was also living out a perfect sinless life in a perfect bloodless parallel universe, we would have no need for Jesus Christ to save us. Why should Jesus need to die for the sins of us people in the fallen parallel universe (here), when each of us sinners also co-exists already as sinless in the perfect sinless parallel universe? The ramifications are really bothersome, when it comes to the biblical truth that we are not capable of being sinless, and need God’s help and Holy Spirit. Jim Wilhelmsen has each and every one of us, starting with Adam and Eve, as being theoretically able to be sinless without God’s help, for all their lives, no Holy Spirit required. It’s like Adam and Eve and all who followed were each a Jesus Christ onto their own in this supposed perfect bloodless parallel universe of “the eternal realm” of “Heaven”. 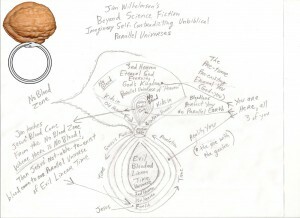 In fact the reason why Jim can combine “Heaven” and “the eternal realm” and all the rest like he does is because this entire idea places us people as having attributes of God and Jesus Christ which we do not have, an eternal backstory that is not true, practically making each of us out to be a pre-existing part of God. Jim has the perspective and characteristics of God and men greatly confused. Again, assigning to people the attributes and qualities of God that He alone possesses is a common satanic ploy, and Jim Wilhelmsen’s teachings are full of them. This is ironic because it is very clear that if you logically add up Jim’s teachings, then re-cycled humanity on a much grander scale is precisely what Jim is teaching. Jim does not teach reincarnation and recycling in this life on a small scale of individuals, but he is teaching that all of God’s children cycle through linear time over and over again in a fallen altered parallel universe, like a snake biting it’s tail. Jim’s description of this cycle looks just like a reincarnation cycle, but on a larger scale. Now that you hopefully can visualize and at least potentially understand the key points of the larger cosmological framework that Jim is teaching, I am going to get the point of how Jim’s teachings are not just wrong and unbiblical, but alter the person of Jesus Christ now, and these teachings are antichrist in that they contradict that Jesus Christ came in the flesh per biblical definition. 2. “The life of the flesh is in the blood.” Lev 17:11 Mortal life is in the blood. This mortal life was given only as a result of the wrong choice during the temptation. Blood is the only dietary law carried over into the New Testament, in the prohibition of eating it. Lev 17:10 and Acts 21:25. The place that Jim calls “Heaven” and the “eternal realm”, Jim defines to also be a parallel universe where we all exist as perfect and sinless, and where no one has blood, as well as being “the Old Heaven”, “the New Heaven” and God’s eternal kingdom of God’s children. In this place Jim calls “Heaven”, a combination of all these places, Jim says no one has blood in their bodies. And Jim also teaches that Adam and Eve only got blood after the Fall, and before that they had no blood in their bodies, because they were created like their Father. Both the words “flesh” and “blood” have to be handled in the same consistent manner in “flesh and blood cannot inherit the kingdom of God”. Jesus’ resurrection body had flesh, and is in the kingdom of God, in Heaven. It is also true that Jesus now has a resurrected “spiritual body”, which His “natural body” was raised to in His resurrection. So putting all this together it is clear that Jesus Christ’s “spiritual body” has flesh, and bones. Because the Bible defines the flesh to be part of the blood as per Gen 9:4 and Lev 17:14 (as well as it simply making plain sense, and NOT being contradicted elsewhere), and Jesus said He had flesh and bone after the resurrection, we can know that a “spiritual body” can have “spiritual body” flesh, blood, and bones, and still can inherit the kingdom of God. The words “flesh” and “blood” must be handled consistently in 1 Cor 15:50, or else the Bible will contradict itself. We know the Bible never contradicts itself, so we can know with surety that “flesh and blood” in 1 Cor 15:50 is a Phrase, which is synonymous with “natural body” as is used a few verses prior in 1 Cor 15:44. The words simply cannot be taken as each are literally disallowed, as Jesus plainly states He had flesh in His spiritual body after the resurrection. Therefore the only solution is that a “natural body” of flesh, blood, and bone cannot inherit the kingdom of God, however Jesus has a “spiritual body” of flesh, blood, and bone which could inherit the kingdom of God. Jesus Christ’s “natural body” (as we have now) was raised from the dead as a “spiritual body” of flesh (including the blood thereof), and bone. And so it is incorrect understanding of the Bible which results in Jim teaching that Jesus Christ has no blood in His body now. Jim also teaches that the blood Jesus Christ had in His “natural body” was different somehow, that being it was not from this fallen parallel universe of linear time. Jim states repeatedly that Jesus Christ’s blood was “unnatural to” or “foreign” or “untainted by” this fallen parallel universe. According to Jim’s cosmological framework, besides this fallen parallel universe in linear time, there is only 1 other place that exists, and that is the “eternal realm” of “Heaven” (with all it’s perfect bloodless parallel universe meaning.) So to be “foreign” or “unnatural” or “untainted” by this fallen parallel universe, Jesus Christ’s blood must not come from the fallen linear time parallel universe that we live in. In Jim’s cosmological framework, there’s only one other place that exists, so there’s only one other place it could have come from, and must have come from there. Jim is teaching that Jesus Christ’s blood must have come from the “eternal realm”/perfect bloodless parallel universe of “Heaven”. Jim teaches that Jesus Christ did not partake as much as any man in both His flesh and blood. The Bible defines the blood to be part of the flesh: “flesh with the life thereof, [which is] the blood thereof”. (Gen 9:4) And so teaching the blood of Jesus Christ was unnatural to the ‘fallen linear time’ parallel universe Jim teaches we live in, is saying that part of Jesus’ flesh was unnatural to this fallen parallel universe, and so was from the imaginary perfect parallel universe that does not exist. Jim is teaching that a part of Jesus Christ’s flesh in his mortal body was from an imaginary perfect parallel universe, in which Adam and Eve never sinned, Seth was their first son, etc. And even if one would want to argue that “flesh and blood: here in Heb 2:14 is again a Phrase referring to the “natural body”, then we get the same result. Jim still is teaching that part of Jesus Christ’s natural body that he was born with, his blood, was not not natural, but foreign and untainted by this fallen ‘linear time’ parallel universe, and so from an imaginary perfect parallel universe that does not exist. Jim alters the person of Jesus Christ and so denies that Jesus Christ fully came in the flesh as the Bible teaches, by stating Jesus Christ was “like us in every way except his blood unnatural to this dimension”. That is NOT what the Bible teaches. The Bible teaches that Jesus Christ was like us in every way, including His blood which was natural to this this universe we live in. Jesus Christ was conceived by the Holy Spirit, and free of sin, and so his perfect life was reflected in His perfect sinless blood. But that blood was natural to the real fallen universe we live in, and not from Jim’s imaginary parallel universe that does not exist. And thus we can know that the spirit behind these teachings of Jim’s is an antichrist spirit, teaching deception, because these teachings contradict that Jesus Christ came in the flesh per biblical definition. There is one additional problem with Jim’s teachings, which is not a paradox, but simply a major self-contradiction. Jim states there cannot be blood in this place he calls “Heaven”, and No one in “Heaven”(all Jim’s meanings for it) has blood, nor can have blood. Yet according to Jim, being unnatural and foreign to this parallel universe, Jesus Christ’s blood came from there. That being the place of bloodless people, where blood is not allowed. If in the perfect parallel universe of “Heaven” no one can have blood, then how could Jesus Christ’s blood have come from the “Heaven” parallel universe? This is where Jim’s entire framework falls apart. Jesus’ blood can’t be from here, so it must be from there. But it also can’t be from there. It’s “unnatural/foreign/untainted” by this fallen linear time parallel universe, so it can’t be from here, but it can’t be from the perfect sinless eternal parallel universe of “Heaven” either, cause there’s no blood allowed there. Jim’s backed himself into an illogical corner with this framework so much so that the only conclusion is that there is no place that Jesus Christ’s blood could be from, according to Jim. It’s not a paradox, it’s just a lot of self-contradiction, unbiblical, and utter nonsense. Here it could seem to you that Jim says Jesus Christ is God in the flesh. BUT look carefully. Jim adds a caveat, to define who this Jesus is, by just simply Having to add that who Jim is referring to is the Jesus who “completed the same but opposite of the wrong decision in Eden”. According to Jim, what happened in Eden? The bloodless Adam and Eve sinned and then blood was added to their bodies. What does Jim teach as the opposite of this? That the Jesus who had blood from an imaginary perfect bloodless parallel universe, lost all that blood, and remains bloodless since. What does that mean? Who is Jim referring to? You guessed it, once again, Jim is referring back to a Jesus whose blood is unnatural to this fallen parallel universe of linear time, and from an imaginary perfect parallel universe. Is that the Jesus Christ the Bible teaches? No.